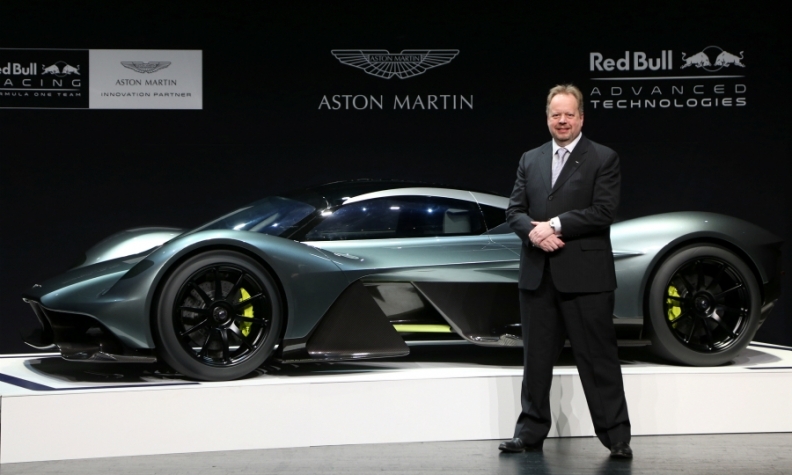 Aston Martin President and CEO Andy Palmer stands next to the AM-RB 001 at the Canadian auto show. 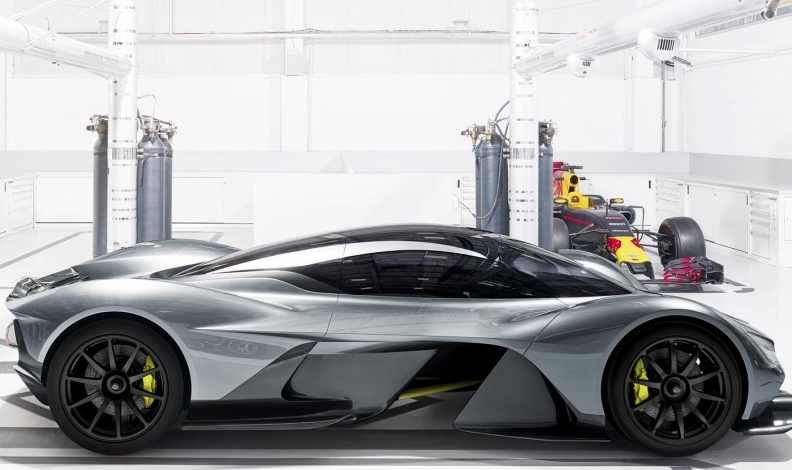 TORONTO -- Aston Martin revealed its AM-RB 001 hypercar to the world Thursday, on the doorstep of its Canadian partner Multimatic, which is supplying the low-slung supercar’s carbon-fibre tub. The luxury automaker and Red Bull Racing’s Formula 1 team have partnered to build the car. The automaker unveiled the car after opening remarks at the Canadian International Auto Show in Toronto. “I assume those screams were for the car and not me,” Aston Martin President and CEO Andy Palmer said as the curtain was raised on the pewter-coloured prototype on stage at the John Bassett Theatre inn the sprawling Metro Toronto Convention Centre. AM-RB 001 is simply a code name given to the vehicle. “I promise you, I’ll change the name,” Palmer said. Palmer said the 6.5-litre, V12 sports car “will be the defining hypercar of this decade.” Hypercar is a term used to define the top one per cent of supercars, or high-performance sports cars. Palmer said it was appropriate to unveil the car in Toronto because Multimatic will build the car’s carbon fibre monocell. Multimatic, of Markham, Ont., has previously worked on the Aston Martin One-77 and Vulcan. The company has also played a major role in developing the Ford GT, which started rolling off Multimatic’s assembly line in December 2016. Aston Martin said lightweight construction is “paramount” in the AM-RB 001. “Multimatic will combine its unrivalled manufacturing experience with Red Bull Advanced Technologies’ knowledge gained from the design and build of ultra-competitive, championship-winning Formula 1 cars,” Aston Martin said in a statement. A maximum of 150 street legal units will be built, including all remaining prototypes, with 25 additional track-only versions. First deliveries are due to start in 2019. All 150 have been spoken for Palmer said. “Almost every email I get is ‘please, may I have another one?’” Palmer said. On its website, Aston Martin calls the AM-RB 001 “a road car the like of which has never been seen before.” A price has not been revealed. It will feature a seven-speed paddle-shift transmission, built to Red Bull Advanced Technologies’ specifications. Croatia-based Rimac will supply the lightweight hybrid battery system. The company has showcased its capabilities with the innovative Concept-One, the world’s first and fastest all-electric hypercar. Meanwhile, Robert Bosch GmbH has been entrusted with developing the engine control unit, traction control and electronic stability program systems for the AM-RB 001. UK light manufacturer Wipac is responsible for the hypercar’s full LED headlamps and tail lamps. The car is part of a major overhaul underway at Aston Martin, which in December began construction on a new facility at St. Athan in Wales. Palmer said the company would replace every current model it offers by 2020 and increase the number of models it offers. The automaker plans to launch a new vehicle every nine months and also intends to unveil the first-ever electric Aston Martin.